Wilhelm Erb and Carl Otto Westphal from Prussia first described the knee jerk in the same issue of the journal Archiv für Psychiatrie und Nervenkrankheiten in January 1875. This article retraces the history of development of 'deep tendon reflex' as an integral clinical sign during every neurological examination. The history of the evolving shapes of the reflex hammer, the iconic trademark and the ultimate signature of a neuroscientist, is also presented. 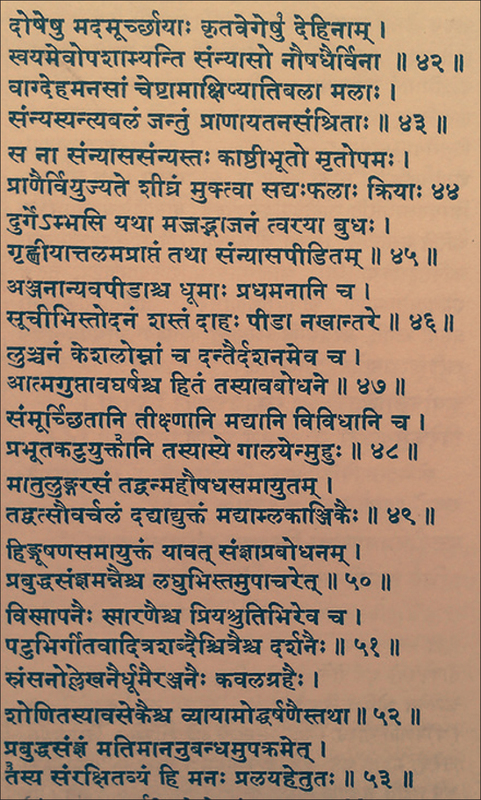 The description of coma and coma arousal therapy in Caraka Saṁhitā is described in sṁtra 24, verses 42–53. 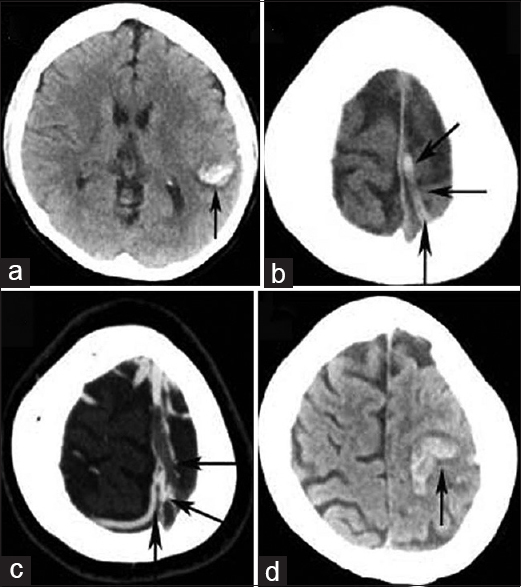 It describes the definition of coma, differential diagnosis of coma from other disorders of consciousness, signs of coma, etiology of coma, coma arousal therapy, and emergence from coma. 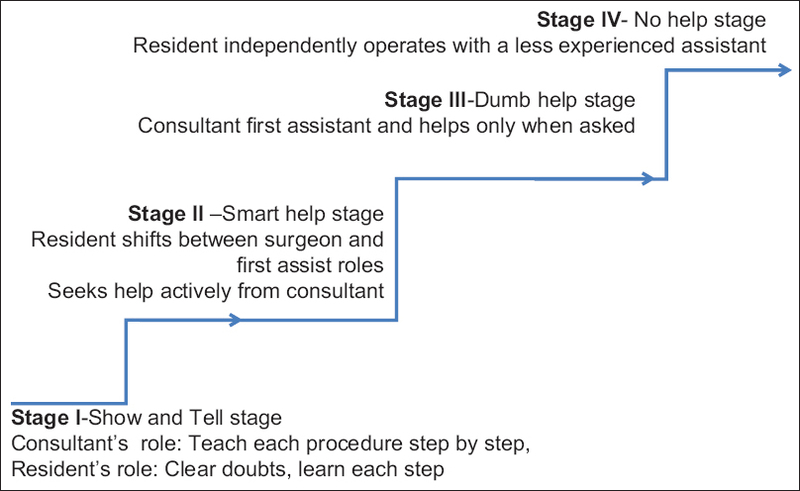 The similarities and differences of these aspects of coma from the perspective of its interpretation in modern medicine are discussed in this article. 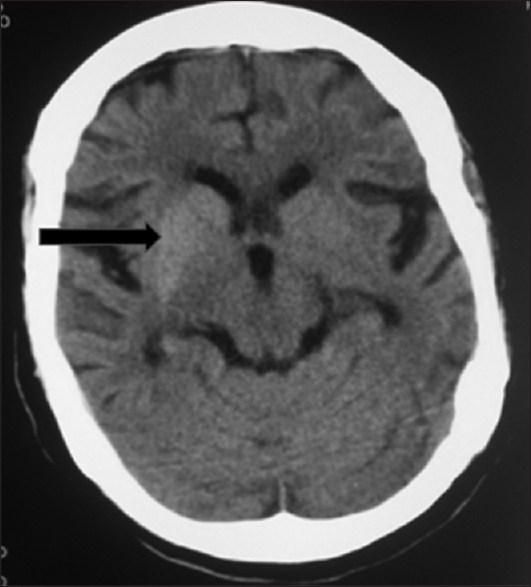 Background: While oxidative stress (OS) may be one of the crucial factors determining the initiation and progression of Parkinson's disease (PD), its correlation with gray matter (GM) atrophy is not known. Aims: To determine the GM volume (GMV) changes using voxel-based morphometry (VBM) and correlation with OS marker serum malondialdehyde (MDA) in PD. 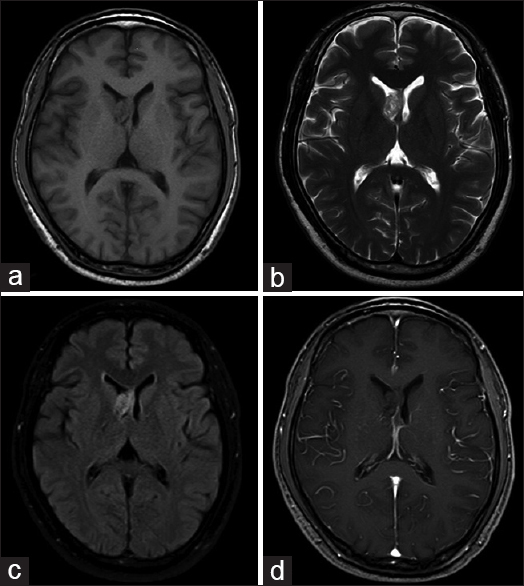 Materials and Methods: Seventy-two patients with PD were clinically evaluated and underwent magnetic resonance imaging (MRI) on a 3T MRI scanner using a 32-channel head coil. Lipid peroxidation product MDA levels were measured by spectrophotometry. 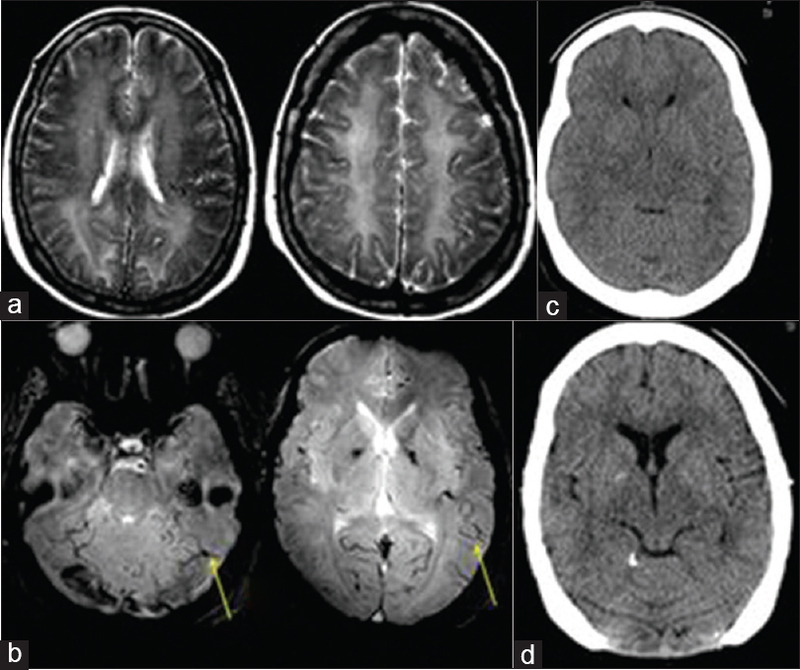 MDA levels and regional GM differences using VBM were compared with 72 healthy controls. 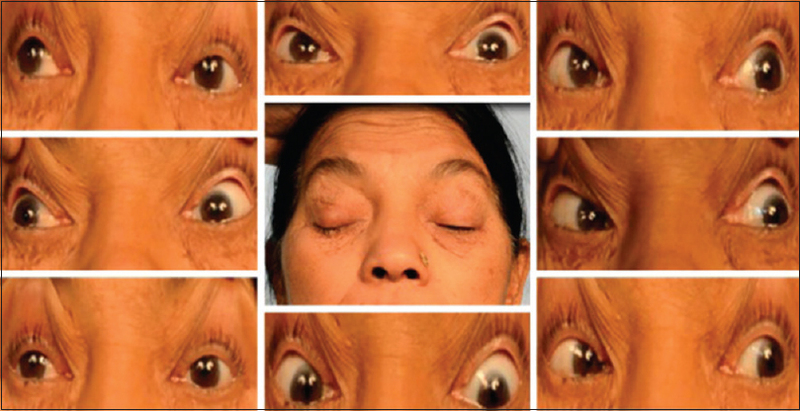 Results: The mean age of the patients was 51.3 ± 10.6 years and that of controls was 50.8 ± 10.4 years. The mean age of onset of symptoms in PD was 45.2 ± 11.3 years. In PD, serum MDA level was significantly higher than that in controls (0.592 ± 0.89 μmol/l vs. 0.427 ± 0.055 μmol/l; P < 0.0001). 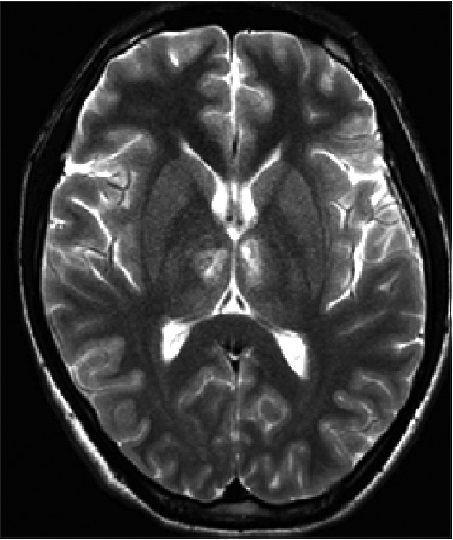 Compared to controls, patients had greater regional GM atrophy in all the brain lobes (P < 0.001, uncorrected). A significant positive correlation was found between GMV and MDA in the caudate nucleus (CN) and posterior cingulate gyrus (PC) in the patient group (P < 0.001, uncorrected). Conclusions: We observed GM atrophy in all major brain lobes of patients when compared to controls. Only in the patient group, a significant positive correlation was observed in CN and PC with MDA. 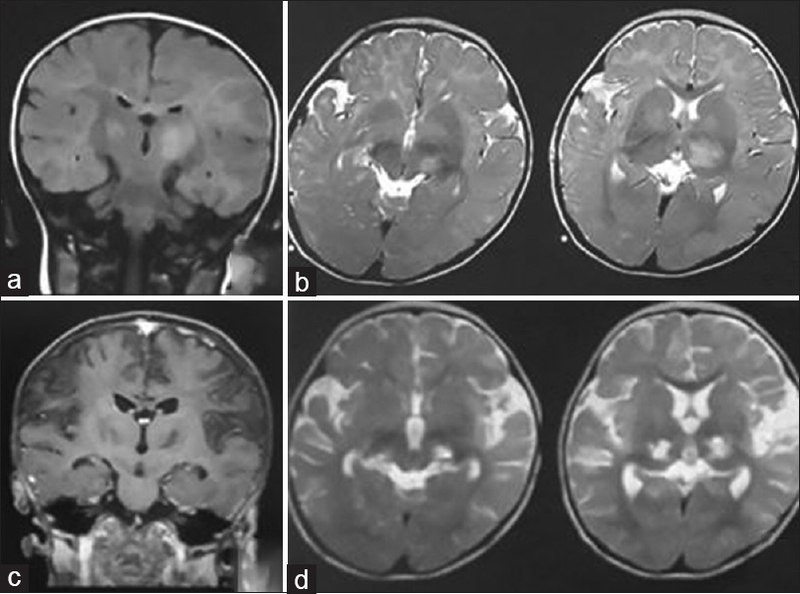 These findings suggest that, even though the whole brain is affected in PD, some of the non-substantia nigra regions of the brain, such as CN, may have some differential compensatory mechanism, which are preserved from oxidative damage. Background: Although very common, sexual dysfunction is a neglected disorder in women with stroke. Aim: To investigate the physical, psychological and sexual changes in women with stroke, and to determine the factors related to these changes. 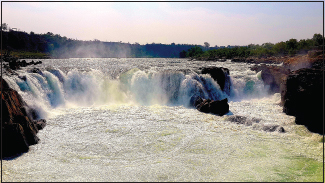 Settings and Design: This descriptive study was conducted at a tertiary care university hospital. Material and Methods: A total of 112 women (51 stroke patients, 61 healthy controls) were included in the study. 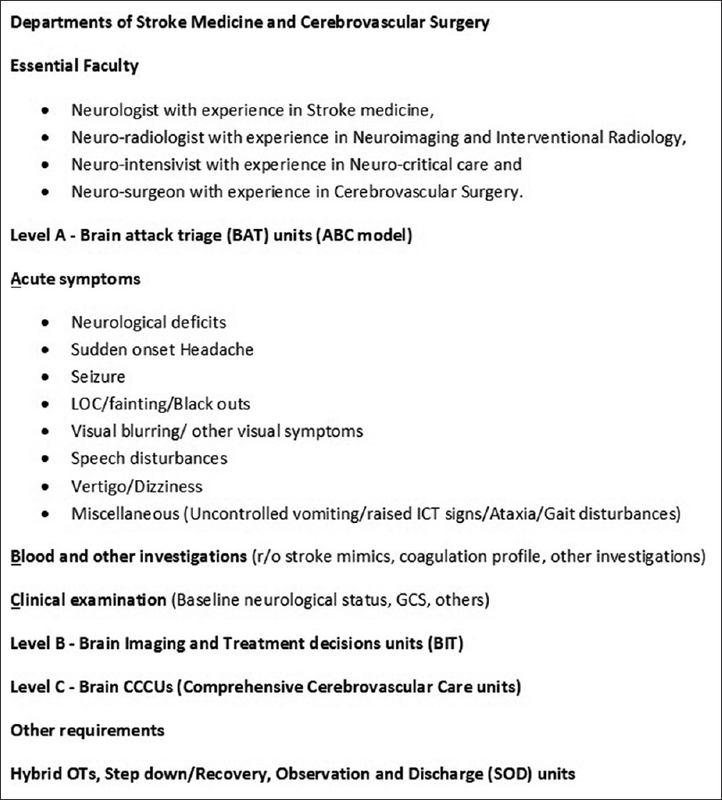 The independence level of stroke patients was evaluated with the Modified Rankin Scale (mRS); the severity of stroke and the clinical status of patients after stroke, with the National Institute of Health Stroke Scale (NIHSS); depression levels, with the Beck Depression Inventory (BDI); and, patients' sexual function, with the Female Sexual Function Inventory (FSFI). Statistical Analysis: The Kolmogorov-Smirnov, the student's t, the Chi-square and the Mann- Whitney-U tests, and the Spearman's correlation analysis were performed in the appropriate conditions. Results: While the scores of total FSFI and FSFI subgroups in women with stroke were lower than in healthy controls, BDI scores were found to be higher than those of controls. A negative correlation was detected between the total FSFI scores, and BDI, MRS, NIHSS, age, duration of marriage and number of children in women with stroke, while a positive correlation was found between total FSFI scores and educational level. Conclusion: Sexual dysfunction is a commonly seen disorder in women with stroke, and is influenced by the severity of disease, level of dependence and accompanying depression. Therefore, evaluation of sexual dysfunction, depression and levels of physical function should be done in women with stroke during their follow up. Background: Asymptomatic carotid artery stenosis (ACAS) is a marker for cerebrovascular disease, coronary atherosclerosis, and death. Aim: To investigate the prevalence of ACAS in the Indian population, and to correlate ACAS with other vascular risk factors. Materials and Methods: We prospectively recruited 1500 individuals who were older than 40 years and asymptomatic for cerebrovascular disease between June 2003 and December 2014. Evaluation of vascular risk factors was done for all the participants. Color Doppler of bilateral carotid arteries was performed for all the participants. 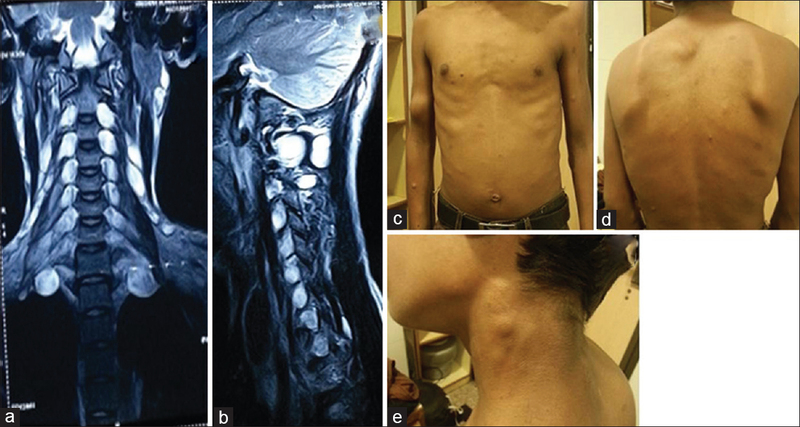 Carotid stenosis of 1–49% and ≥50% was considered to be mild and significant stenosis, respectively. Results: There were 1016 (67.7%) men, with a mean age of 58.1 ± 10.6 years (age range: 40–98 years). 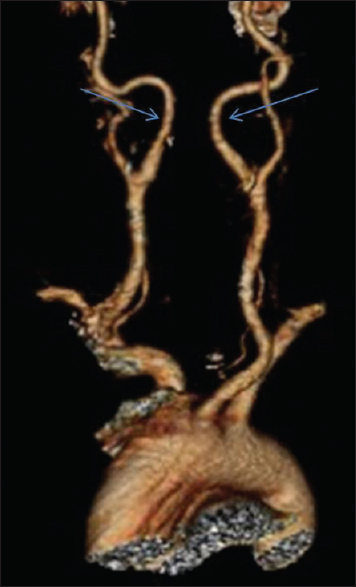 The prevalence of significant carotid stenosis was 5.2%. After adjustment using multiple regression analysis, age >70 years (OR: 2.0; 95% CI: 1.48–2.74), hypertension (OR: 1.8; 95% CI: 1.11–2.96), diabetes (OR: 2.3; 95%CI: 1.45–3.89), smoking (OR: 3.6; 95% CI: 2.18–6.03), dyslipidemia (OR: 4.0; 95% CI: 2.52–6.63), history of migraine (OR: 3.6; 95% CI: 2.54–9.13), history of periodontitis (OR: 3.2; 95% CI: 1.90–5.68), and family history of stroke (OR: 7.1; 95% CI: 4.20–12.2) were significantly associated with >50% stenosis. Duration (>15 years) of hypertension (OR: 2.5; 95% CI: 1.33–6.43), diabetes (OR: 6.2; 95% CI: 3.41–11.3), and smoking (OR: 5.2; 95% CI: 2.20–12.1) markedly worsened the risk. 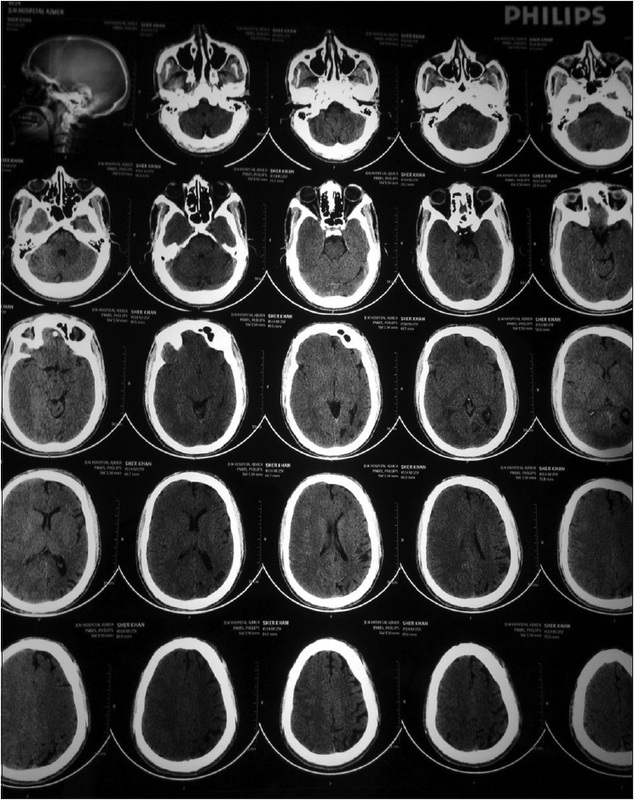 During the 8-year follow up, 14 participants (1.4%) with mild stenosis and 3 participants (4.7%) with significant stenosis developed stroke. 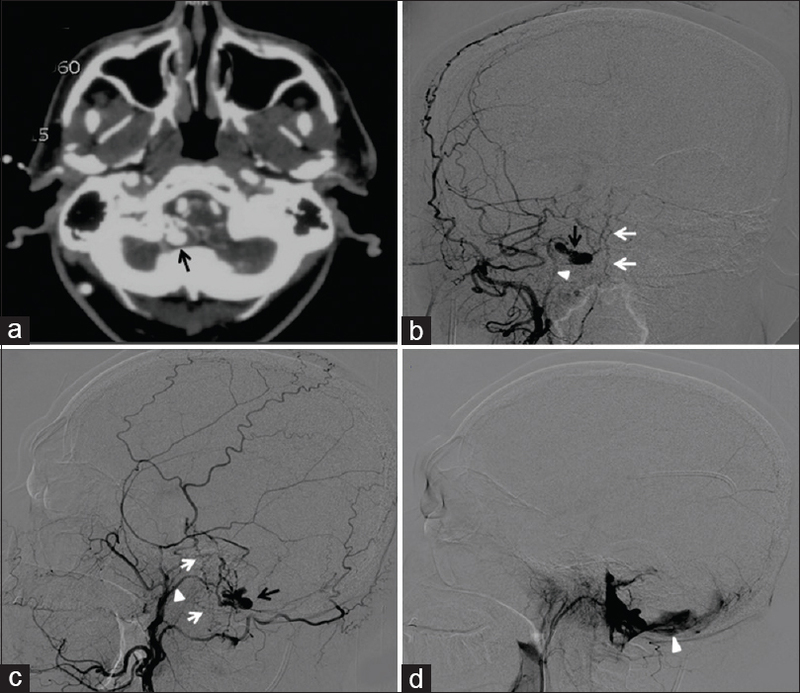 Conclusions: Our study suggests that 5.2% of asymptomatic individuals > 40 years of age harbor significant extracranial carotid artery disease. Presence of multiple vascular risk factors markedly increases the risk of carotid stenosis. 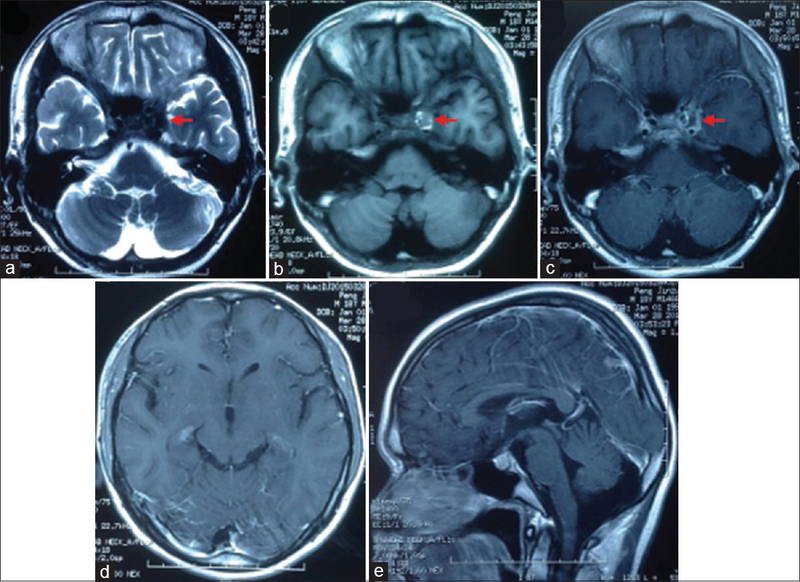 Objective: Functional magnetic resonance imaging (fMRI) studies in healthy volunteers have shown alterations in brain connectivity following anesthesia as compared to the awake state. 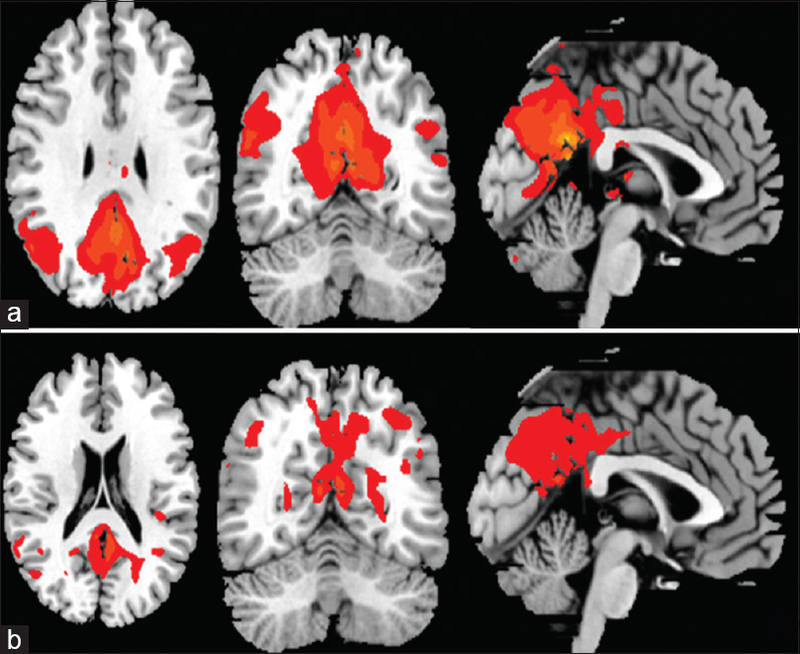 It is not known if the anesthesia-induced changes in brain connectivity are different in a pathological state. 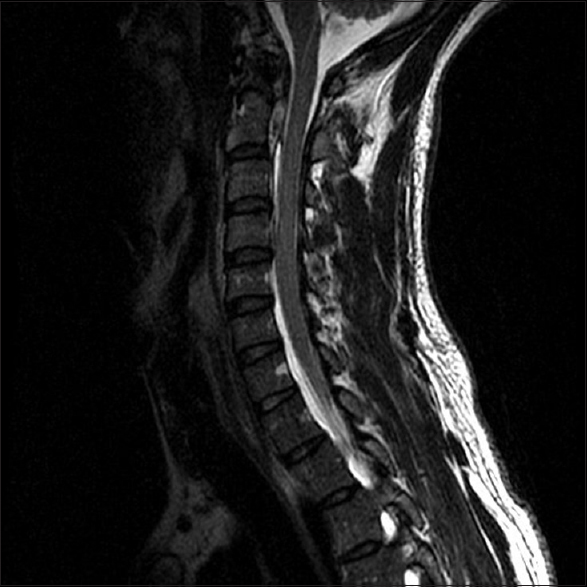 This study aims to evaluate changes in the resting state functional connectivity in the brain, after propofol anesthesia, in patients with chronic back pain (CBP). Materials and Methods: Fourteen adults with CBP were included in this prospective study over 6 months. 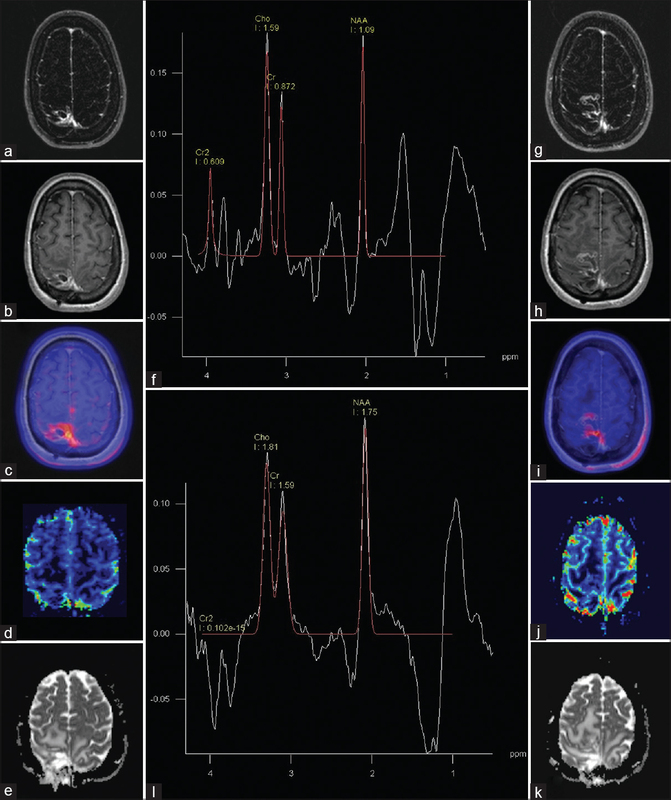 After excluding structural brain pathology, a resting state fMRI was performed in the awake state, and the sequences were repeated after propofol anesthesia. The primary outcome measure was change in resting state connectivity after propofol. Student's t-test was performed between the pre and post-propofol sedation data of all patients with total brain volume as covariates of interest. A repeated measures analysis of variance was used to compare pre- and post-propofol changes in cardiorespiratory parameters. Results: There were 8 male and 6 female patients in the study, and the mean age of the study population was 46.9 ± 11.3 years. 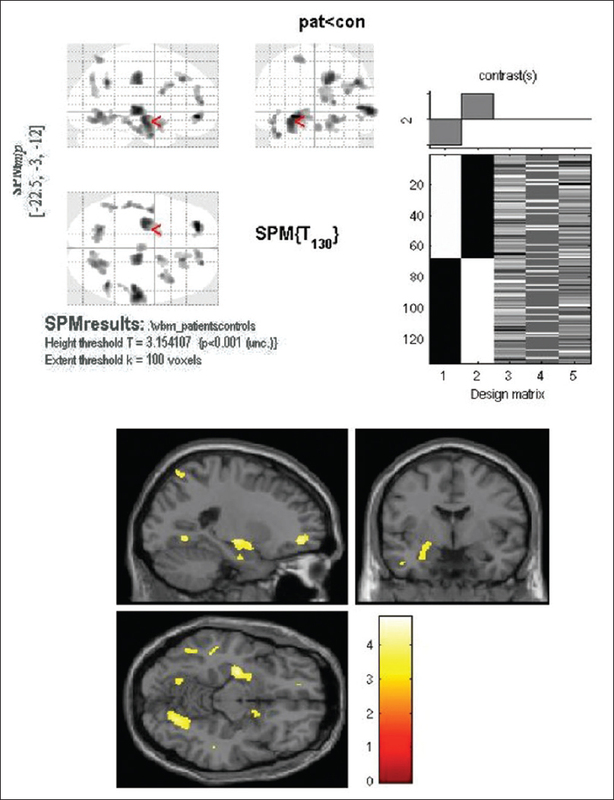 Propofol sedation resulted in an increased strength of functional connectivity between the posterior cingulate cortex (PCC) and thalamus in patients with CBP, whereas there was a generalized decrease in functional integration within the large scale brain networks. The changes in cardiorespiratory parameters before and after propofol administration were not statistically significant. Conclusion: Strengthening of functional connectivity was seen between PCC and thalamus with decrease in large scale brain networks following propofol anesthesia in patients with CBP. These changes are similar to those previously described in normal volunteers. 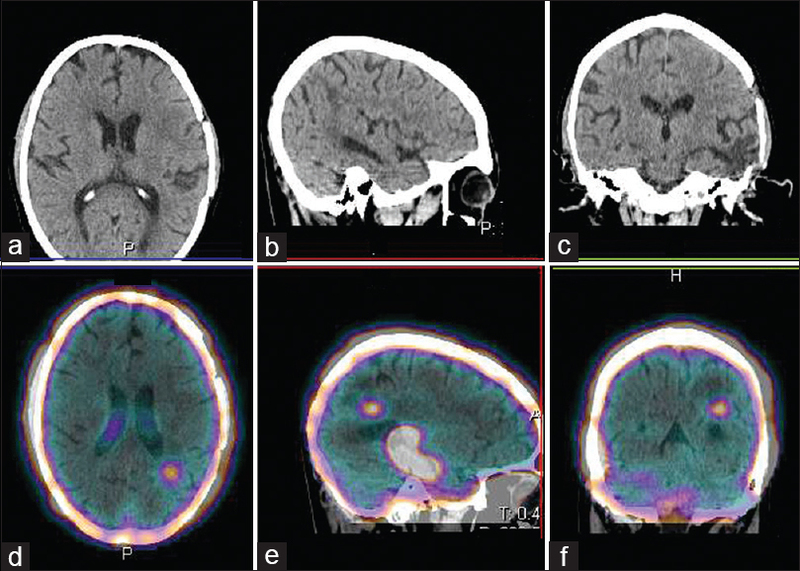 Purpose: To assess the utility of 18F-fluoroethyl-L-tyrosine (FET) positron emission tomography/magnetic resonance imaging (PET/MRI) in distinguishing recurrence from radionecrosis. 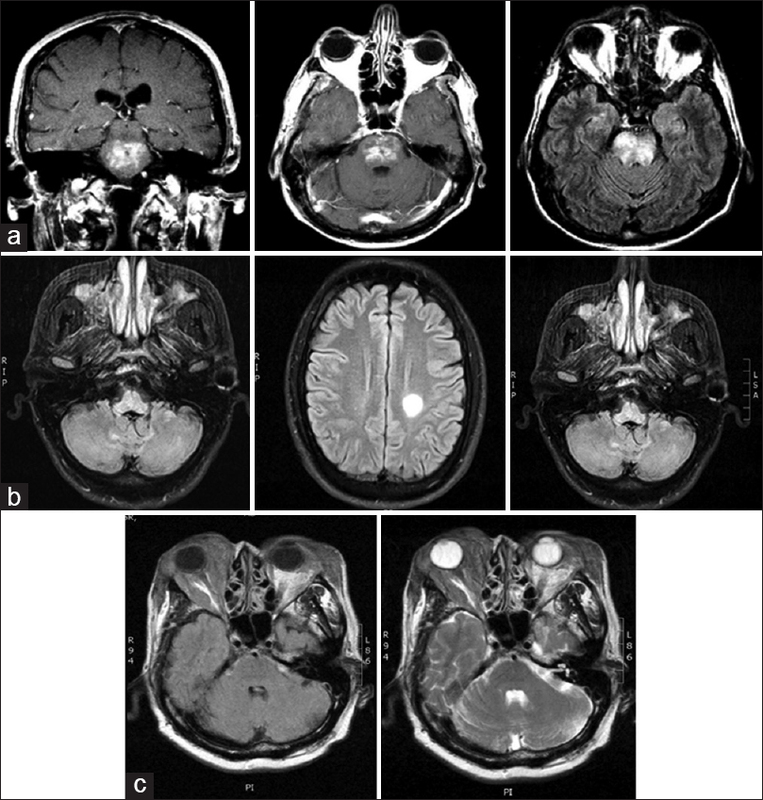 Materials and Methods: Thirty-two patients (25 males, 7 females) of glioma who had already undergone surgery/chemoradiotherapy and had enhancing brain lesions suspicious of recurrence were evaluated using integrated 18F-FET PET/MRI, and followed up with histopathology or clinical follow-up and/or MRI/PET/MRI imaging. Manually drawn regions of interest over areas of maximal enhancement or FET uptake were used to calculate tumor to background ratios [TBRmax, TBRmean], choline: creatine ratio [Cho: Cr ratio], normalized relative cerebral blood volume [N rCBVmean] and apparent diffusion coefficient [ADCmean]. Correlations were evaluated using Pearson's coefficient. Accuracy of each parameter was calculated using independent t-test and receiver operator curve (ROC) analysis while utility of all four parameters together using multivariate analysis of variance (MANOVA) for differentiating recurrence vs. radionecrosis was evaluated. 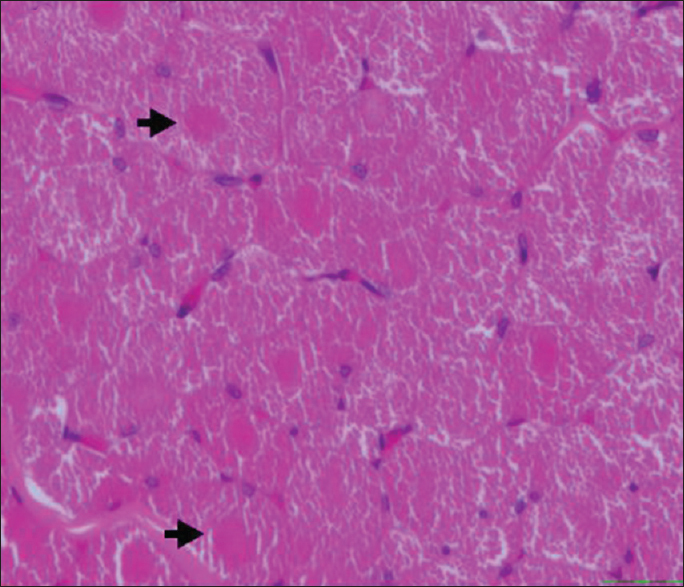 Positive histopathology and imaging/clinical follow up served as the gold standard. 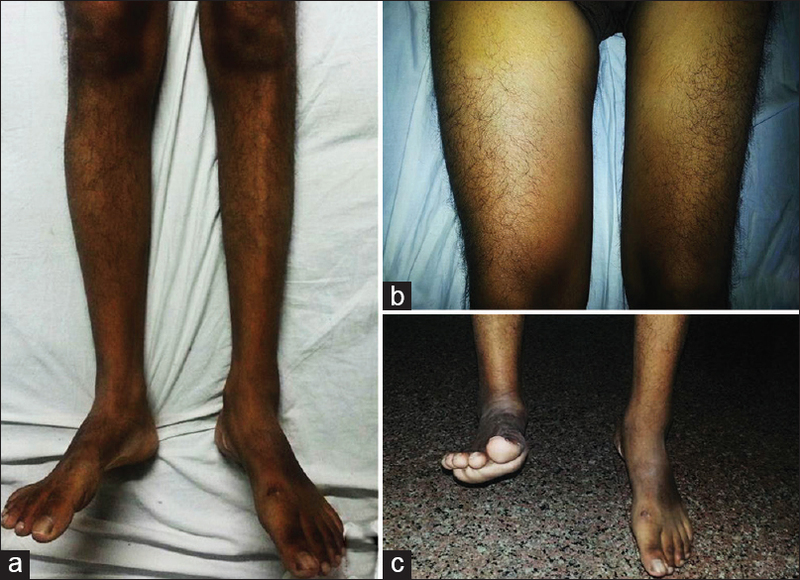 Results: Twenty-four of the 32 patients were diagnosed with recurrent disease and 8 with radiation necrosis. Significant correlations were observed between TBRmaxand N rCBVmean (ρ =0.503; P = 0.003), TBRmean, and N rCBVmean (ρ =0.414; P = 0.018), TBRmaxand ADCmean (ρ = −0.52; P = 0.002), and TBRmeanand ADCmean(ρ = −0.518; P = 0.002). 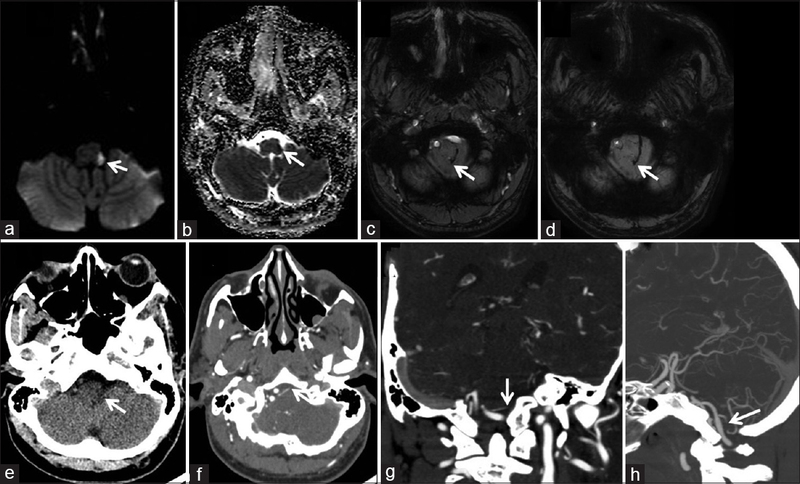 TBRmax, TBRmean, ADCmean, Cho: Cr ratios, and N rCBVmeanwere significant in differentiating recurrence from radiation necrosis with an accuracy of 94.1%, 88.2%, 80.4%, 96.4%, and 89.9%, respectively. MANOVA indicated that combination of all parameters demonstrated better evaluation of recurrence vs. necrosis than any single parameter. 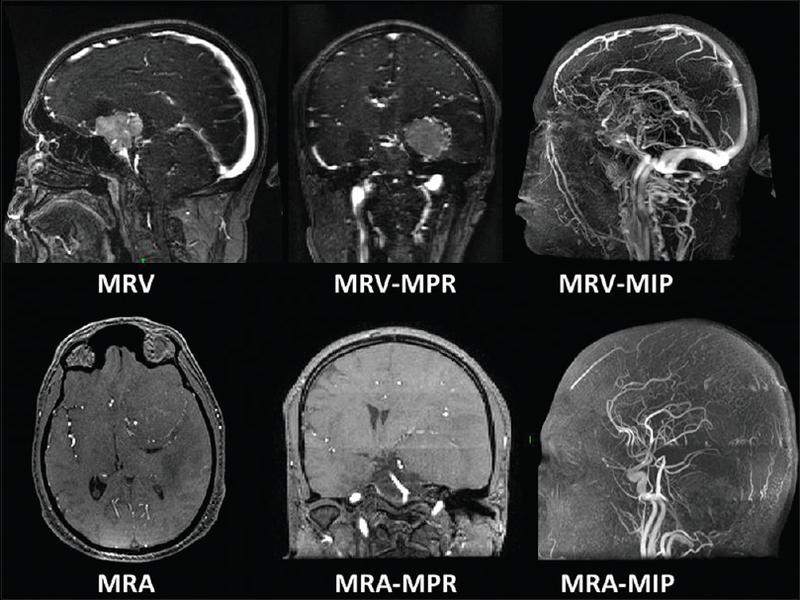 The diagnostic accuracy, sensitivity, and specificity using all MRI parameters were 93.75%, 96%, and 85.7%, and using all FET PET/MRI parameters was 96.87%, 100%, and 85.7%, respectively. 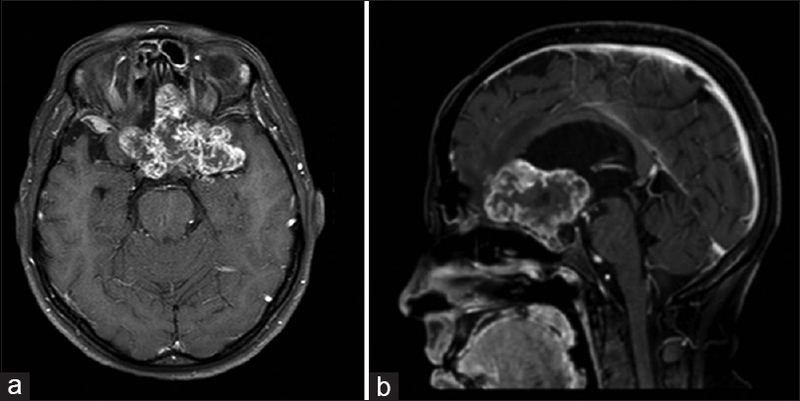 Conclusions: Synergetic effect of multiple MR parameters evaluated together in addition to FET PET uptake highlights the fact that integrated 18F-FET PET/MRI might have the potential to impact management of patients with glioma by timely and conclusive recognition of true recurrence from radiation necrosis. Introduction: Over a quarter of the world's trauma deaths occur in India, with traumatic brain injury (TBI) as the leading cause of death and disability within trauma. 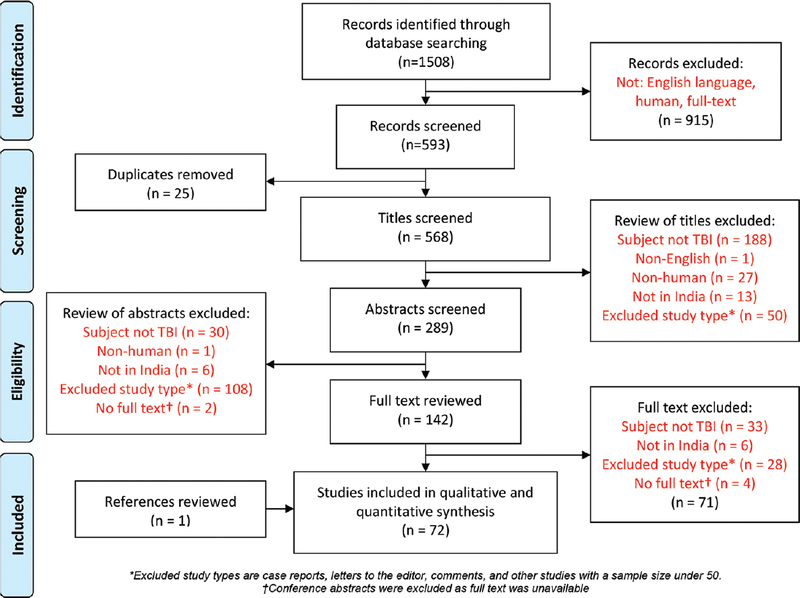 With little known about TBI in India, we set out to do a systematic review to characterize the quantitative literature on TBI in India. Materials and Methods: The following databases were searched from their inception to December 31, 2015: PubMed, Cochrane, Web of Science, and the World Health Organization's Global Health Library, using the keywords: neurotrauma, brain injury, traumatic brain injury, TBI, head injury, and India. Articles were screened by two independent reviewers, with disagreements arbitrated by discussion or a third reviewer. Results: A total of 72 manuscripts were included, encapsulating 19962 patients over 27 years in 14 states of India. The sample-size-weighted mean age was 31.3 years, male-to-female ratio was 3.8:1, and sample-size-weighted mean in-hospital mortality was 24.6%. Age and mortality did not change significantly over time. Road traffic accidents (55.5%) and falls (29.2%) were the most commonly reported mechanisms of injury for TBI in India. 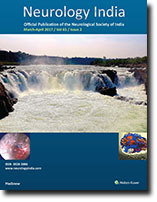 The mean quality of reporting on TBI in India was 65.7%, according to the appropriate EQUATOR guideline score. Conclusion: The quality of reporting of quantitative studies published on TBI in India is low, and future methodological excellence should be ensured. The demographics and outcomes identified can be used as an epidemiological baseline for future research on TBI in India. Future research can build upon this platform to develop and refine context-appropriate policy recommendations and treatment protocols. 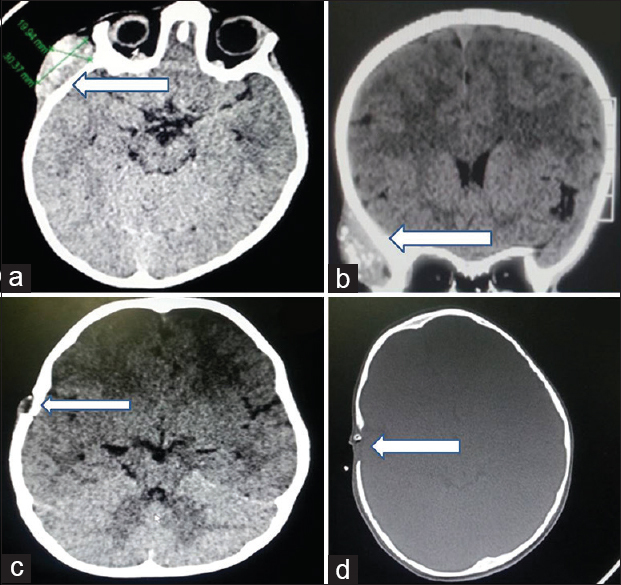 Introduction: The high success rate in the management medulloblastoma achieved in the western world is not exactly mirrored in developing countries including India. Socio-demographic differences, health-care disparity, and lack in uniformity of care with resultant widespread variations in the clinical practice are some of the reasons that may partly explain this difference in outcomes. 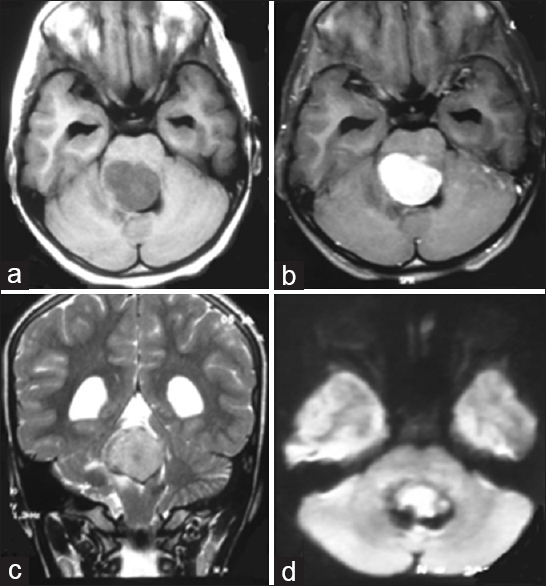 Patients with medulloblastoma require a multi-disciplinary team approach involving but not limited to neuro-radiology, neurosurgery; neuropathology, molecular biology, radiation oncology, pediatric medical oncology and rehabilitative services for optimizing outcomes. 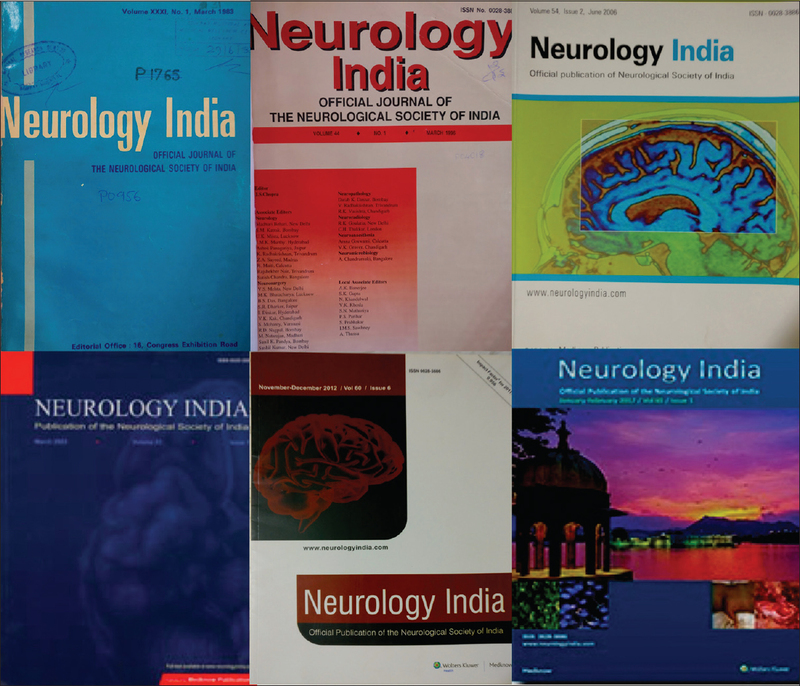 Methods: The Indian Society of Neuro-Oncology (ISNO) constituted an expert multi-disciplinary panel with adequate representation from all stakeholders to prepare national consensus guidelines for the contemporary management of medulloblastoma. 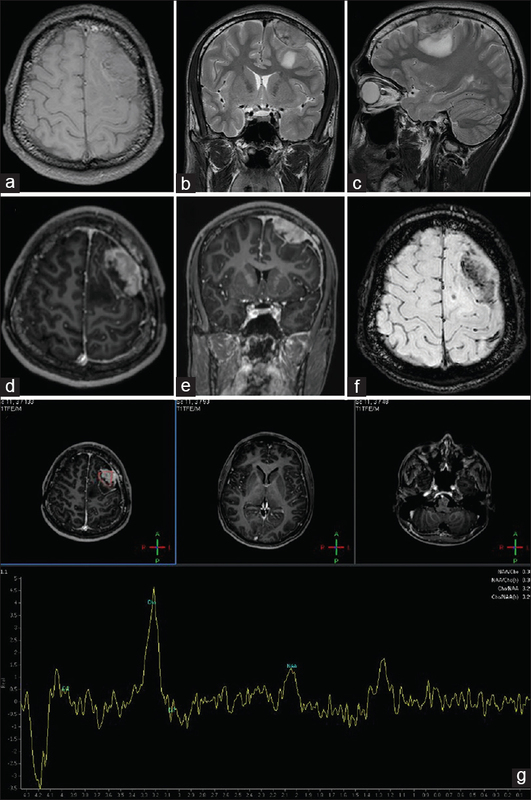 Results: Minimum desirable, as well as preferable though optional recommendations (as appropriate), were developed and adopted for the pre-surgical work-up including neuroimaging; neurosurgical management including surgical principles, techniques, and complications; neuropathology reporting and molecular testing; contemporary risk-stratification in the molecular era; appropriate adjuvant therapy (radiotherapy and chemotherapy); and follow-up schedule in medulloblastoma. 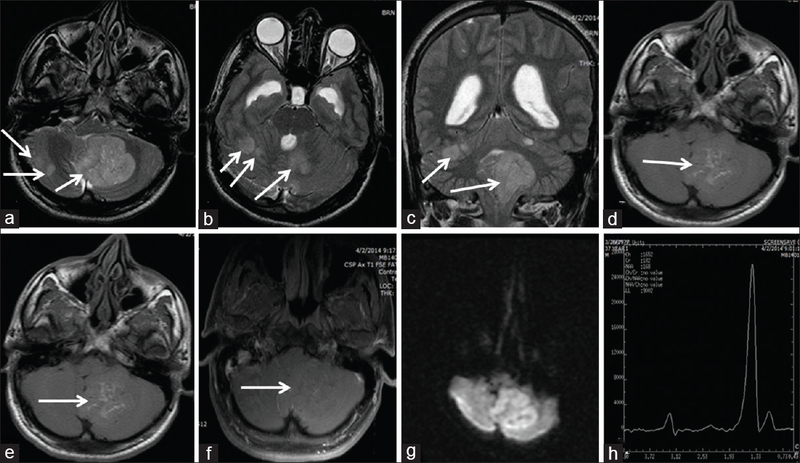 Conclusions: The current document represents a broad consensus reached amongst various stakeholders within the neuro-oncology community involved in the contemporary curative-intent management of children with medulloblastoma. It provides both general as well as specific guidelines and recommendations to be adopted by physicians and health care providers across India to achieve uniformity of care, improve disease-related outcomes, and compare results between institutions within the country. 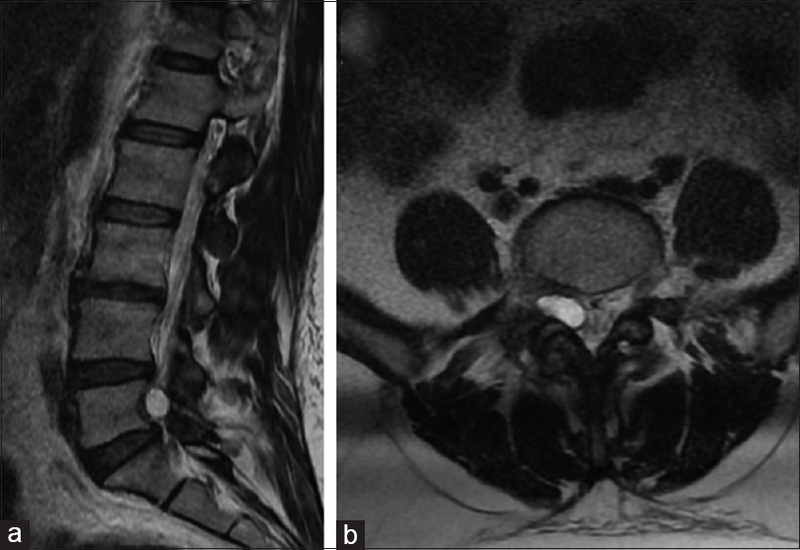 Although posterior approaches are being used frequently in most atlantoaxial dislocations (AAD), anterior decompression is also required in some patients in whom the C1-2 dislocation is not properly reduced by the posterior approach. 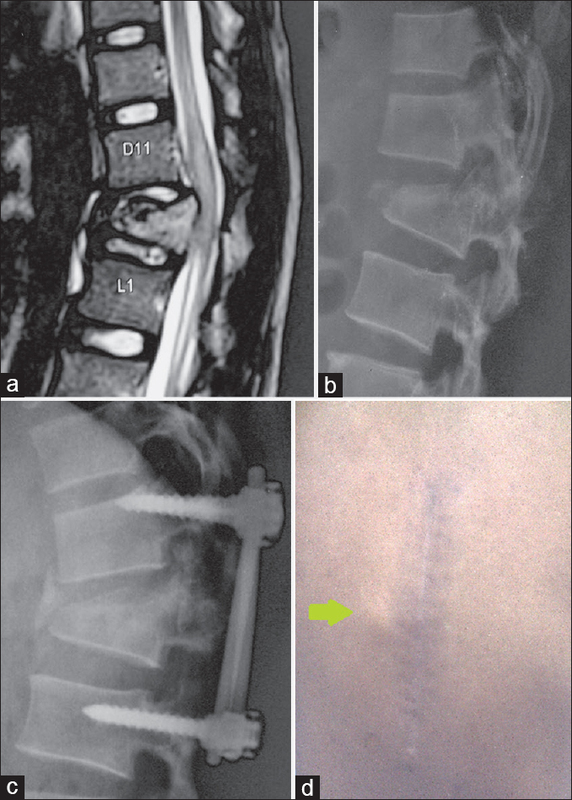 Transnasal and transoral approaches need an additional posterior approach to perform atlantoaxial fusion. They also have an added risk of infection. 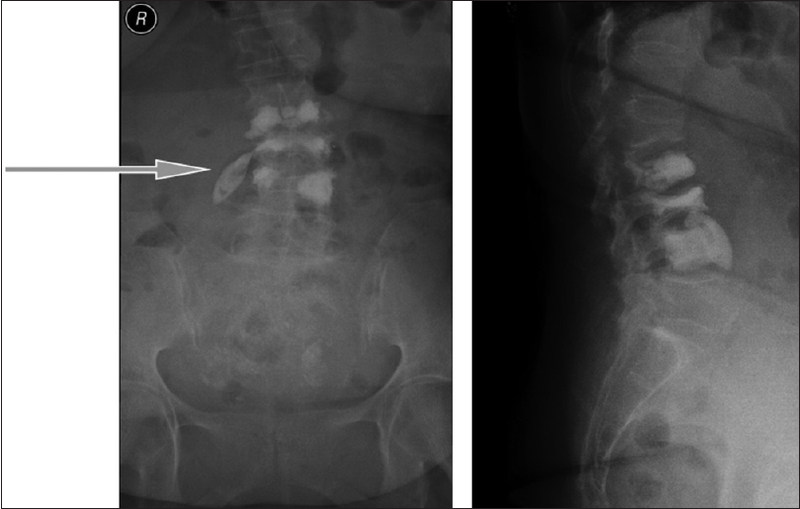 The endoscopic transcervical approach can be used for single-stage cervical decompression and stabilization that includes an odontoidectomy and anterior fusion. 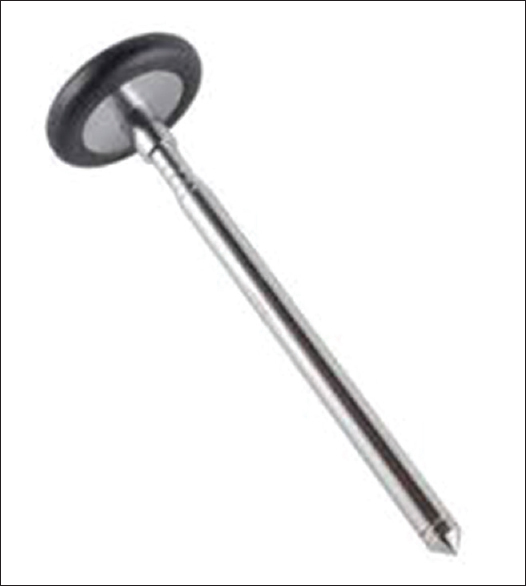 It can be used both in reducible and irreducible AAD. 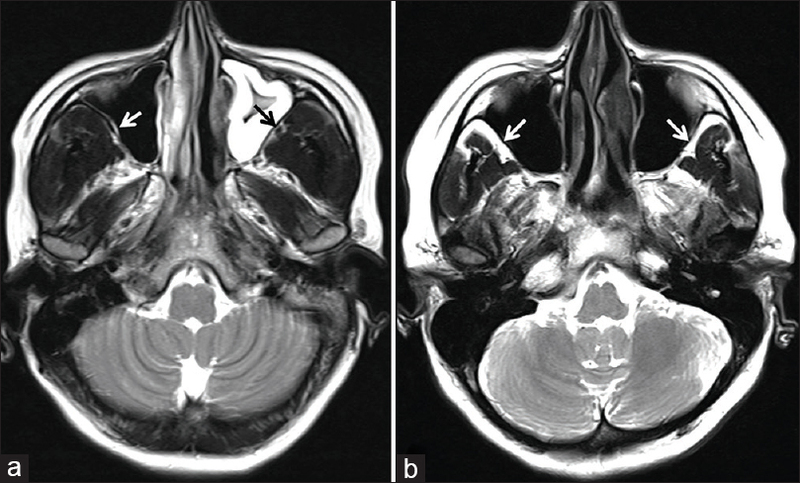 Patients with a high basilar invasion, traumatic or other lesions involving the C1 or C2 facet joint, reducible AAD with Chiari malformation, and patients with a large mandible or a mandible angle lying below the C3 level even after the maximum neck extension, should not be subjected to this procedure. 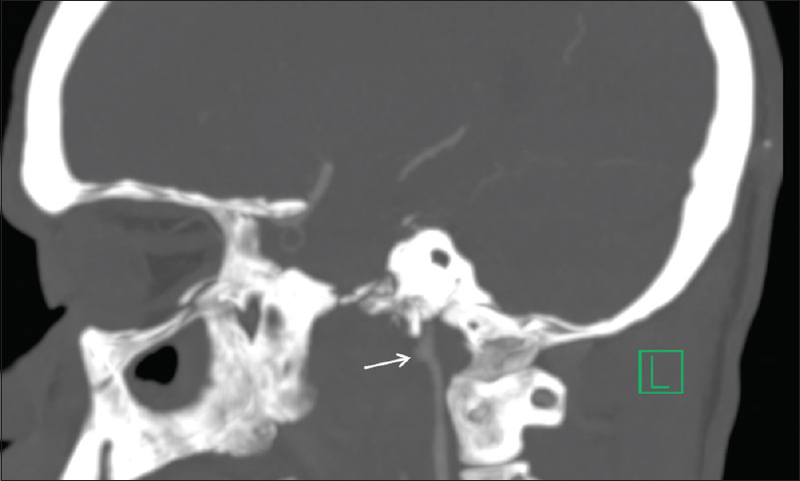 Preoperative X-ray, computed tomography (CT) scan with angiogram, and magnetic resonance imaging of the craniovertebral region should be done to assess the dislocation. 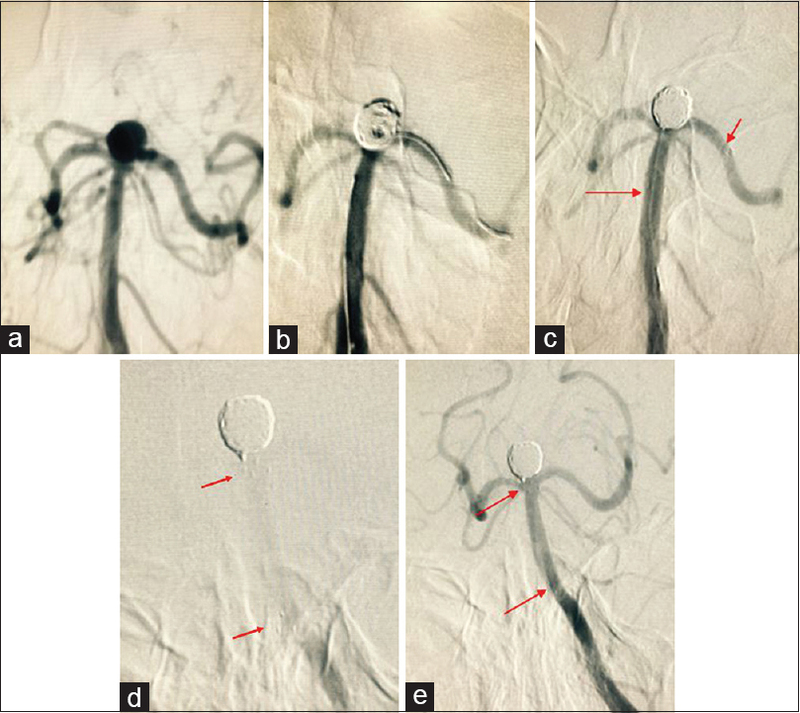 The early results of an endoscopic transcervical approach were found to be safe and effective for decompression and fusion in our experience. There was no permanent complication. The procedure avoids a two-stage surgery; thus, odontoidectomy, if needed, can be performed in addition to the C1-2 fusion in a single stage. The Department of Neurosurgery founded in the Trivandrum Medical College, Kerala, the first teaching hospital in Kerala state, is celebrating its 50th anniversary. The history of Neurosurgery in this Institute is synonymous with the history of Neurosurgery in the state as this was the first medical college to start a Neurosurgery department within the state.The students after undergoing their rigorous training in the department, went on to establish advanced neurosurgical centres throughout Kerala and in several other parts of the country. 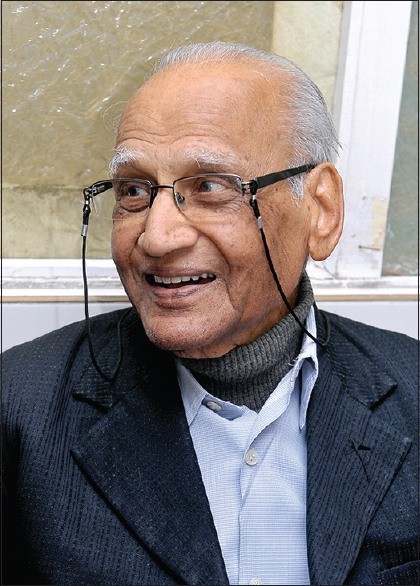 This article traces the illustrious history of the Department of Neurosurgery, Trivandrum Medical College and also of the eminent faculty members and residents, who helped in advancing the standards of Neurosurgery in the region as well as the rest of India. The Department of Neurosurgery was founded in the Trivandrum Medical College, Kerala, the first teaching hospital in Kerala state, in the year 1951, and is celebrating its 50th anniversary. The history of Neurosurgery in this Institute is synonymous with the history of Neurosurgery in the state as this was the first medical college to start a Neurosurgery department within the state.The students after undergoing their rigorous training in the department, went on to establish advanced neurosurgical centres throughout Kerala and in several other parts of the country. 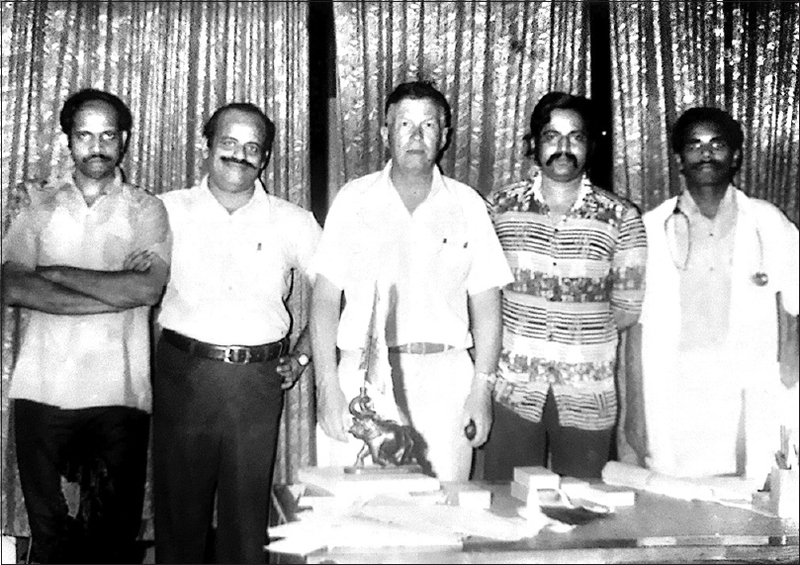 This article traces the illustrious history of the Department of Neurosurgery, Trivandrum Medical College and also of the eminent faculty members and residents, who helped in advancing the standards of Neurosurgery in the region as well as the rest of India.